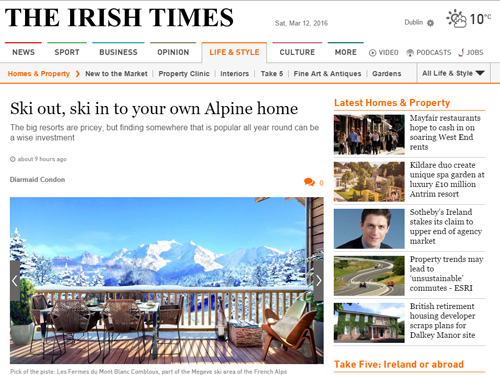 Today’s Irish Times Alpine Ski Property Feature (March 12th, 2016) can be found in full on the Irish Times website here. This piece is just to add a few extra details for those that may be looking at a property in the French Alps. Daniel Elkan runs the informative www.snowcarbon.co.uk website which organises non air transport based visits to the Alps. Savills has produced a useful ski property market overview which can be found at http://bit.ly/1QqR1zv. Savills Alpine Homes on +41 27 323 77 77 or visit www.alpinehomesintl.com. Erna Low at +44 207 590 1624 or visit www.ernalowproperty.co.uk.